Eddie Burkhalter, The Anniston Star, Ala.
As depleted bank accounts and extra pounds are counted, it's easy to feel a little blue this time of year, but there are ways to ease the pain of returning back to work and school after the holidays, according to mental health professionals. Dr. Lucile Bodenheimer, a clinical psychologist who practices in Anniston, said she often treats people who find themselves with post-holiday blues. Stress, unrealistic expectations, lack of sleep and a bad diet can all coincide this time of year and can dampen spirits, Bodenheimer said. In some of the more severe cases of depression, medication may be needed, she said, but for most of what she sees, lifestyle changes and talking through problems can help. People tend to eat lots of food high in carbohydrates during the holidays, Bodenheimer said. In her research, she found that all those carbs can sap energy, and in some cases bring about depression. "With little exception, most people eat an awful lot of sweets. They're drinking a lot of sugary products, and of course we now know that even the sugar substitutes will have this affect on you," Bodenheimer said. To feel better, cut out the carbs and sugar, drink plenty of water and get some exercise, she said. And people should get back to their normal routine as quickly as possible, "which whether they like it or not, it gives them some stability and structure," Bodenheimer said. Another big step is to quit comparing oneself to others, as some of us tend to do as we gather together for family celebrations, Bodenheimer said. "You can't keep up with the Joneses, and quit trying to keep up with what the movies and television tells us is the norm," Bodenheimer said. "That successful cousin that's rubbing it in your nose? I promise you they've got disadvantages that they're hiding." And family life for most wasn't all tinsel and cheer, so by setting high expectations that Christmas will be perfect this time, we may be setting ourselves up for a letdown, Bodenheimer said. "Most of us didn't get along 100 percent with our families and siblings growing up ... But we've got this unrealistic expectation that we're going to be together full-time for a day or several days in a row," Bodenheimer said, and that everything will be just great. The problem is that family dynamics change, Bodenheimer said, and around the holidays "you get back into your childhood power-struggles. In families we develop myths about who we are, and it was probably true at one time, but we all change." Post-holiday blues are not the same thing as Seasonal Affective Disorder, Bodenheimer warned. The later is a type of depression thought to be cause by reduced sunlight in the fall, although a very small number of people can be diagnosed with the disorder in the summer as well. Holidays are potentially some of the happiest, and saddest moments of the year, said Anniston Clinical psychologist Dr. Joe Howell. Howell said he also treats people after the holidays each year who say they feel a little down. "And it's because they're focused mostly around love relationships," Howell said. "And love relationships give us the happiest moments of our lives and also the saddest." Grief can resurface during the holidays as well, Howell said, as people remember those they've lost in the past, whether it be from a seperation or from a death. "The abscence of these people, or the trauma around which the seperation occured, usually get's highlighted in the brain during times of family togetherness," Howell said. 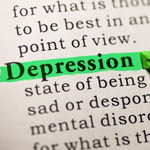 Howell said that some warning signs of a more serious depression for those with post-holiday blues are trouble sleeping, and a feeling of impending doom and accute anxiety. For those persons, Howell recomends they seek help from a mental health professional, and added that most everyone with depression can get better with help. "They need to get out of it and find some happiness, because there's a great big wonderfull world out there that has colors and mountains and fragrances and lots lof love," Howell said. "And once we focus on those wonderfull things, there's no room for the gloom and doom." While some can feel down this time of year, experts have dispelled the long-standing myth that suicides spike during the holidays. The months of November, December and January have the lowest numbers of suicides per day in the U.S., according to the University of Pennsylvania's Annenberg Public Policy Center. The Center for Disease Control's National Center for Health Statistics support that claim, and note in a 2008 study that the U.S. suicide rates are lowest in December. Staff writer Eddie Burkhalter: 256-235-3563. On Twitter @Burkhalter_Star.